An important document in the social history of India, this volume presents the autobiography of a Punjabi family over the three tumultuous generations that spanned years from the Mutiny to Independence. The book provides an absorbing view, from within, of what British rule meant for the educated elite of the province. 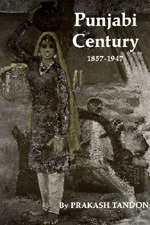 In its descriptions of the changing customs and values of the educated Indian in the early twentieth century, the book affords a memorable account of a critical period in modern Indian history.